Every so often that story comes along that reminds us of what it's like to experience love for the first time -- against the odds, when you least expect it, and with such passion that it completely changes you forever. An unexpected discovery takes eighty-four-year-old Lily Davis Woodward to 1945, and the five days that forever changed her life. Married for only a week before her husband was sent to fight in WWII, Lily is anxious for his return, and the chance to begin their life together. In honor of the soldiers' homecoming, the small Georgia town of Toccoa plans a big celebration. And Jake Russo, a handsome Italian immigrant, also back from war, is responsible for the elaborate fireworks display the town commissioned. But after a chance encounter in a star-lit field, he steals Lily's heart and soul--and fulfills her in ways her socially-minded, upper-class family cannot. Now, torn by duty to society and her husband--and the poor, passionate man who might be her only true love--Lily must choose between a commitment she's already made and a love she's never known before. 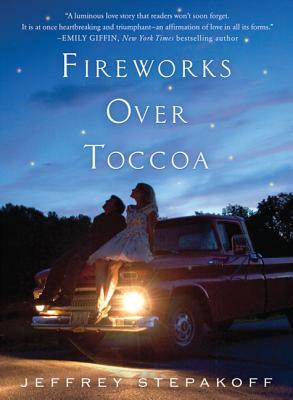 Fireworks Over Toccoa takes us to a moment in time that will resonate with readers long after the book's unforgettable conclusion. A devastating and poignant story, this debut novel will resonate with anyone who believes in love. JEFFREY STEPAKOFF has written for more than a dozen different television series, including the Emmy-winning The Wonder Years, Sisters, and Dawson’s Creek, for which he was co-executive producer. Author of the acclaimed novel, Fireworks Over Toccoa, he has also developed and written plays, TV pilots and major motion pictures. Stepakoff holds a BA in journalism for UNC-Chapel Hill and an MFA in playwriting from Carnegie Mellon. He lives in Georgia with his wife and three young children. His fiction is published in six languages.